More than 80 percent of software bugs will be found in less than 20 percent of software modules. 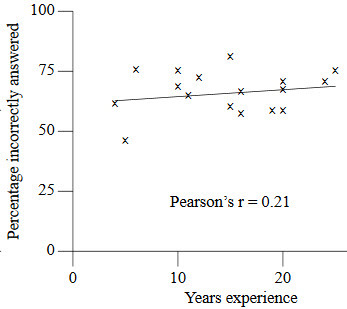 Pareto Principle as modified by Capers Jones. Does anyone remember the Sony-Tek oscilloscopes from the 1970s? 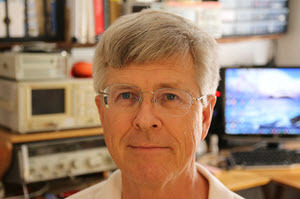 Tektronix realized that their big-buck products priced many smaller outfits out of the market so partnered with Sony to create a line of cheaper alternatives. They were OK, but we found them to be somewhat unreliable with a poor UI. Engineering soon managed to dump them on the production people and continued using the Tek 7000-series units, which were a dream to use but could be insanely pricey. Today the big players still offer expensive and very capable units, but Chinese competitors (e.g., Rigol, Siglent, Owon, etc.) now offer very good units for astonishingly-low prices. A few years ago Tek countered with their attractively-priced TBS1000. Keysight has a new line of low-cost scopes that start at $448 for a 50 MHz unit. If anyone is using these low-cost Tek or Keysight units, let me know what you think of them; I'll share the feedback with Muse readers. Do you know the precedence rules for C? Most of us don't. Precedence experiments reported in "Developer Beliefs About Binary Operator Precedence"
Thanks to Dennis Ritchie and his team the first C compiler was released way back in 1972. The C language has found its own place in developing embedded system software, real-time operating system policy implementations and device drivers ranging from simple 8-bit microcontrollers to complex 32-bit FPGA targets. This article takes you through the basics of C-supported operators and describes an easy way to remember the priority of operators while evaluating an expression. 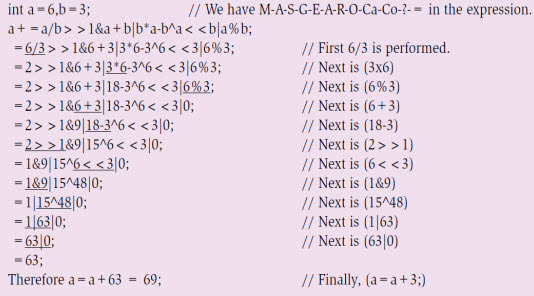 If you can remember the slogan 'MA-S-G-E-A-R-O-Ca-Co-?-=' (left to right), any C expression can be calculated without actually typing the expression in a C compiler. 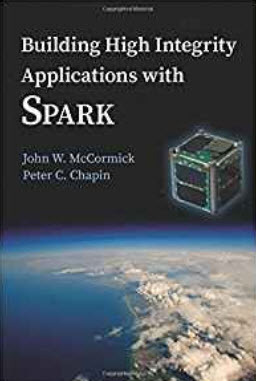 Many books provide a standard table discussing the priority of operators and their associativity. But, when an expression is given, it is a little cumbersome to work it out by recalling the table all the time. This article also serves as an easy way to keep the order of priority on the fingertips. Let us take the example of priority of execution of C expression shown in Fig. 2. This expression evaluation is simple; since only arithmetic operators are involved, where multiplicative operators (multiplication, division and modulo division) have high priority, while additive operators (addition and subtraction) have lower priority. If the expression is found to have operators of the same level of priority, evaluation starts from left to right (associativity). Step-by-step evaluation is also mentioned by specifying the high-priority operator with an underline. Now, let us see how priority of the expression changes if we introduce bit-wise operators (bit-wise AND - &, bit-wise EXOR - ^ and bit-wise OR - |) in combination with arithmetic operators. For our use case, let us consider the expression shown in Fig. 3. Notice that, initially, multiplicative operators from left to right are evaluated. Then come additive operators; finally, when we land with only bit-wise operators, order of priority is first bit-wise AND, followed by bit-wise EXOR with bit-wise OR at the end. The expression, which has to be evaluated, is underlined for each step. In the above expression, we missed the shift-left (<<) and shift-right (>>) operators. In fact, these are at the third position in the rhyme. Consider another expression given in Fig. 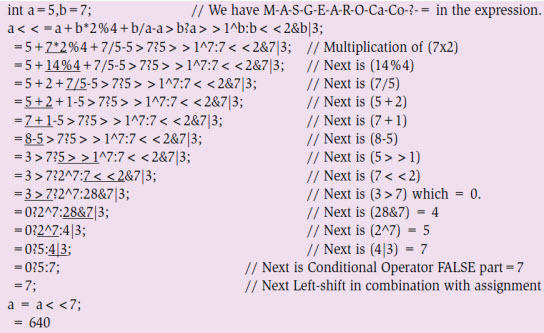 4, where multiplicative, additive and all bit-wise operators exist, including shift operators. This expression looks crispy, and no coder opts for it. However, if you are asked to work on driver development with RAM memory organisation whose CPU registers are not bit-addressable, you may land up with expression(s) like this. 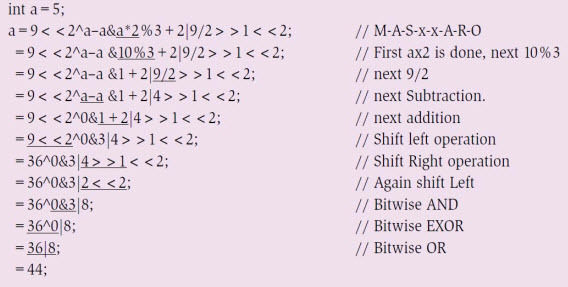 As advised, you have to follow the order of the slogan, considering the priority with multiplicative -> additive -> shift-left or shift-right -> bit-wise AND -> bit-wise EXOR -> bitwise OR to evaluate the expression for arriving at the correct answer. Let us add relational operators of the two operands and try to get the value of the expression shown in Fig. 5 by following the priority order of the operator rhyme. Note that, within the available relational operators, there exist two priority levels among equality operators (low) and greater or less than operators (high). Next, let us observe the behaviour of compound conditional AND (&&) and compound conditional OR (||) statements, too. Among these, logical AND (&&) has higher priority compared to logical OR (||). In the expression given in Fig. 6, again, by following the operator's priority rhyme, the step-by-step value is obtained. The assignment operator (=) is the last priority in the rhyme. Note that, other than the regular assignment operator, a combination of assignment with arithmetic operators or with bit-wise operators too may fall under this observation. For example, consider the expression in Fig. 7. After evaluating the complete expression on the left-hand side, 63 is the result. Next, we have an assignment operator concatenated with an addition operator; this addition will be performed in the end, yielding the final value as 69. Finally, consider the expression shown in Fig. 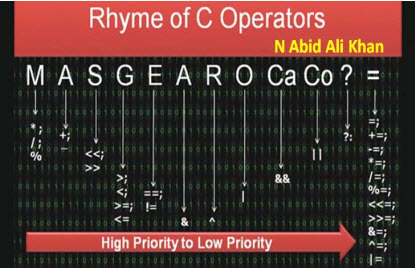 8, where most operators are deliberately used to understand how to evaluate to a final value, by following the order of priority as per the rhyme. Although the expressions given in Figs 5, 6 and 7 are vague in nature—which a developer rarely adopts, for the other expressions, especially expressions that can be a combination of multiplicative, additive, bit-wise and assignment operators in a single expression, precedence of operators will come in force. As per the operator's rhyme from left to right, value can be calculated. If you want to sell a device that connects to the Internet to the French government, your product must comply with the Certification Securite de Premier Niveau (CSPN) rules. It's hard to find much about CSPN in English but a new article in Embedded Computing Design is a must read for developers planning to export gear around the world. Under CSPN a third party organization, licensed by the French government, does the security evaluation of a product. 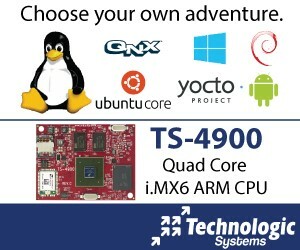 It appears only three such groups currently exist for embedded devices. The good news is that the evaluation must be completed in 8 weeks, and will require only about one person-month of time from the vendor. Security is a huge concern. While CSPN is probably a step in the right direction, I'm concerned that the process apparently treats a product as a black box. The referenced article suggests no internal information needs to be supplied to the evaluators. Bitter experience has taught us that apparently secure products still contain vulnerabilities. The Common Criteria, another certification standard, requires that the NSA does a full analysis of the source code for the highest (EAL7) evaluation level. The costs are staggering. The device has an enable input used to shut the part down; the datasheet claims in this mode as little as 50 nA is required. That's a bit disingenuous as this is based on a "typical" spec. I think it's poor design to use anything other than the rated max, which is 100 nA - still a decent number. The datasheet is frank and correct about design rules, such as the careful selection of output capacitors due to their ESR and being careful in selecting one as the capacitance of MLCCs is degraded by applied voltage. It includes a number of sample circuits. Constrained by form factor? The device can run with an 0603 inductor. It's not listed on Mouser's or Digi-key's web sites yet but other sources suggest pricing is/will-be $1.23 in 1000-unit lots. Vol Taire sent a better form of the Dr. Suess joke in the last Muse.